It’s probably fair to say figuring out how to get salt is one of the first real challenges that many Glitches face. 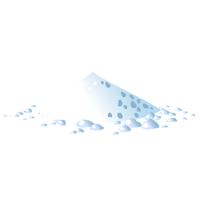 Salt is important stuff, it’s a vital food, essential for our well-being, and more importantly, is a key ingredient in very many recipes, both in Glitch and in the real world. In Glitch, salt is deemed to be a spice, and so it manufactured just like any other spice by grinding allspice. In reality, salt is actually a mineral, and we have to work a little harder to get it. The substance we commonly refer to as ‘salt’ is actually sodium chloride, although the salt we eat in our day-to-day life will most likely have a few other things mixed in with it, either naturally, or added artificially during the refinement process. Typical additives include anti-caking agents such as sodium ferrocyanide which is used to help keep the salt free-flowing, potassium iodide to help combat iodine deficiency, and fluoride salts to help prevent dental decay. Halite, or rock salt can be found in large beds formed by the evaporation of lakes and seas millions of years ago. Britain’s largest salt mine is found in Winsford, Cheshire where the salt deposits were formed by the evaporation of sea water during the Triassic period, 220 million years ago. Salt can be extracted from these underground salt mines by excavation or by forcing water through a drilled shaft to dissolve the salt and bring it up to the surface. Another common way to get salt is by the evaporation of sea water – and salt obtained in this manner is usually referred to as sea salt, especially when used for culinary purposes. Many people believe that sea salt has both better taste and texture for use in cooking, due to the presence of of other minerals. 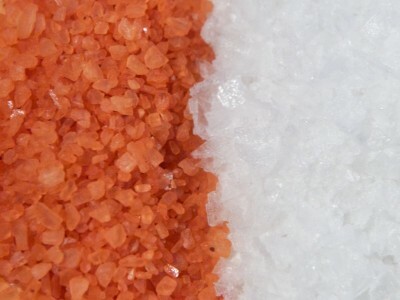 The coarse texture of sea salt also affects the way in which it dissolves in the mouth, lending it a different and more subtle flavour than that given by ordinary table salt. Many places around the world produce good quality sea salt for use in cooking. The variety I tend to use most is Maldon Sea Salt, from Maldon in Essex. As well as adding flavour in cooking, salt is also used to preserve food, and is commonly used to allow meat and fish to be kept for long periods. Salt’s importance to us is reflected not only in its ubiquity in our cooking, but also in our language. The word salary is derived from the Latin salarium, which originally denoted the payments made to Roman soldiers to allow them to buy salt. The words sausage and sauce both come from the Latin salsus, meaning ‘salted’. Salad originally denoted leaves that had been salted to reduce their bitterness, and is derived from the Latin sal, ‘salt’. This entry was posted in Spices and tagged pinch-of-salt by dopiaza. Bookmark the permalink.